Welcome to our newest group of wines for the lovers of intense, full-flavored and extremely elegant wines from Napa, CA. These hand-crafted wines are created slowly and carefully, aged in French oak cooperage and released only when ready for people with a very discriminating palate. Savor the complexity of our 2006 Cabernet Sauvignon from Mt. Veeder with brooding dark violet color, layers of fruit and oak nuances and backbone that will age for many years to come. You may prefer the fruitier and more delicate 2006 Napa Melot from Rutherford, still imposing with a deep color, powerful nose and silky end notes, and lending itself to many food pairings. I suspect that some of you, like me, will finally decide upon our 2006 Napa Syrah from Yountville with chewy bountiful dark fruits and a very long flavor profile. Whichever of these new wines you try, I think you will agree that the wait was worth the effort. Initial release date will be August 1, 2008. 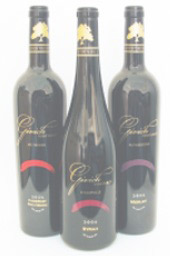 Don’t wait too long to order as these wines are made in very small quantities and are sure to sell out.